​No 28 Squadron was formed on 7 November 1915 at Gosport but due to a number of changes that have been taking place, it has not been possible for the Squadron to celebrate its centenary until now. The date of 7 April 2016 was chosen to mark the event and it was also the day the Squadron moved into its new hangar facilities at RAF Benson in Oxfordshire. Operational since October 2015, 28 Squadron operates as the combined Chinook and Puma Operational Conversion Unit (OCU), the two former OCUs for the respective helicopter types merging in order to provide the best value for money for defence and the tax payer. 28 Squadron’s role is to produce front line aircrew for RAF Benson (Puma) and RAF Odiham (Chinook), in order to supply helicopter lift capabilities to the British Army, Royal Marines and other Defence and Government agencies. The Pumas and Chinooks are used to provide troop transportation, casualty evacuation, re-supply, disaster relief (as seen during the recent UK floods) and military aid to the civil community. As well as using live aircraft the Squadron utilises state of the art flight simulation to train its Support Helicopter aircrew. 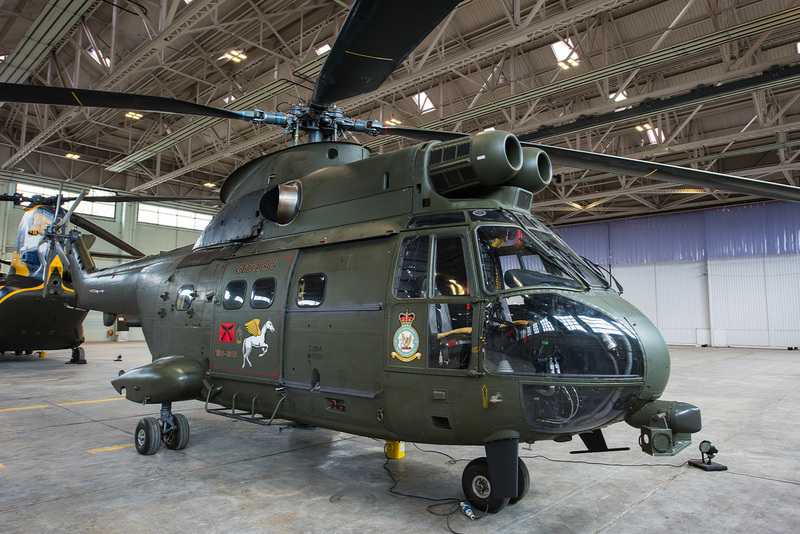 Students arriving at 28 Squadron will have initially trained at RAF Shawbury in the basics of helicopter flying before moving to the OCU to convert onto the Puma and Chinook. The training will include dealing with underslung loads, flying at low level, in cloud and at night. 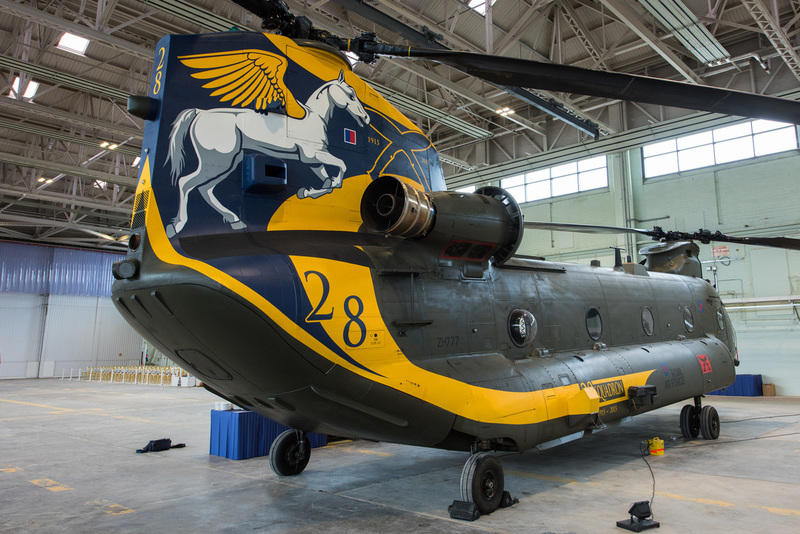 In celebration of the centenary two of the Squadron’s helicopters, Chinook HC.4 ZH777 and Puma HC.2 ZJ954 were suitably adorned with a special paint scheme and decals which feature elements of the Squadron’s badge. ​The Chinook has had a demi-Pegasus painted onto the helicopter’s tail rotor pylon together with the Gurkha Flash of 48 Gurkha Infantry Brigade. The Kukri Flash commemorates 28 Squadron’s former forty year association with the Gurkhas which ended in 1994. The Squadron was asked by the Brigade to wear the Flash to remember its connection with the Gurkhas, a tradition that continues to this day. The Puma has had decals applied to the main doors which can easily be removed should the helicopter be required for rapid deployment. 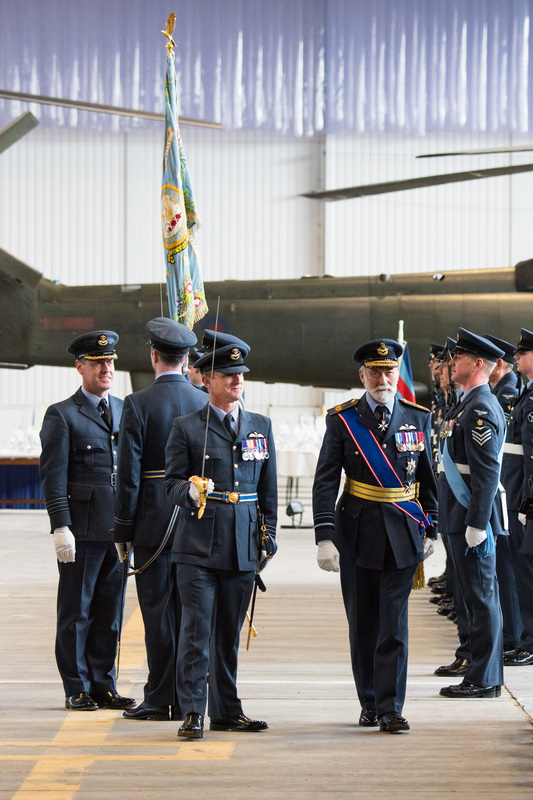 ​On the day of the event, Squadron members were joined by former Commanding Officers for a formal Royal parade in their newly refurbished hangar. The parade of over ninety RAF personnel was reviewed by Prince Michael of Kent GCVO with a backdrop provided by the Chinook and Puma. As the music, provided by the Band of the Royal Air Force Regiment, played and the personnel marched it felt like all those who had gone before in No 28’s long history were present within the hangar if not in body but in spirit. “I am honoured to command a squadron with such an illustrious history and an exceptionally bright future. We are always mindful of the Squadron’s heritage and our actions today honour all those who have served 28 Squadron previously. Today I have the privilege to command a Squadron of dedicated and passionate personnel, from engineers, operations, admin and safety equipment staff to the students and the instructors who provide the training, all of whom allow 28 Squadron to provide the best training to all future RAF support helicopter aircrew and I am incredibly proud of all the Squadron has achieved, today and over the past century. My thanks go to Chris Cannon of http://www.simplyplanes.co.uk/ ​and Nikki Hamilton, Station Engagement Officer, RAF Benson for arranging and facilitating my attendance on the day.